Ever wanted to run your own Fantasy Soccer League? I've been running a soccer fantasy league for over 15 years now. What started with just my mother and I, then a few other family members and close friends soon escalated to over 30 people in the league. Originally I used a pen, paper and calculator (as well as a copy of the Daily Mirror!) and spent many hours working out the scores, working out the table, writing it down, printing copies off and posting league updates off to those not so near. Time consuming and expensive but still worthwhile. As I started using a computer I learnt that I could do the workings out on an Excel spreadsheet and eventually discovered that I could post these spreadsheets as web pages so that people could see the tables online. Thus FantasyFootyLeague.com was born. I added contact forms so that members could email transfers and soon worked out how to add a form to submit transfers. It was still time consuming though, especially when people were making transfers. I knew I needed a dynamic, database driven site, like the professional ones if the league was to advance further and to save my time and sanity. This was something that was beyond me and I searched and searched for a Fantasy Football Web Script to no avail. There were a few, very crude ones available but nothing I could use. There was only one thing to do - PAY someone with the necessary skills to code the site for me. And after a lot of time, cash and headache the site is running exactly how I want it. 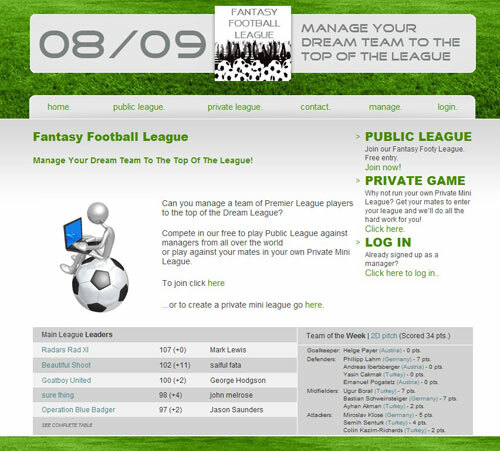 There are even private mini leagues now, all updated from the same database I use to run our own league (yes, many of the original players are still there, including my dear old Mum!). This got me thinking though, I'm sure there are many others like myself, wanting to run their own Fantasy Sport Site who don't have thousands to spend on developing the site/script themselves. This is why I am now going to make available the same code that runs FantasyFootyLeague.com for a fraction of the cost it was to develop it (not to mention the hours spent planning it). Eventually I plan to port this web script to other sports including cricket, F1 racing etc but for now please take a look at our Fantasy Soccer Web Script.